"Washington Senate" redirects here. For the Senate in Washington, D.C., see United States Senate. The Lieutenant Governor of Washington serves as the President of the Senate, but only casts a vote if required to break a tie. In his or her absence, the President Pro Tempore presides over the Senate. The President Pro Tempore is nominated by the majority party caucus and elected by the entire Senate. The President Pro Tempore is a largely ceremonial position in the Senate. The primary leaders of the respective caucuses are the majority and minority leaders, which are elected by their respective party caucuses. Lieutenant Governor Cyrus Habib is constitutionally the President of the Senate. The current President Pro Tempore is Karen Keiser. The Majority leader is Democrat Sharon Nelson, who assumed office following a special election that gave Democrats a majority. The Minority Leader is Republican Mark Schoesler. 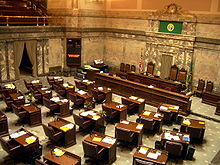 ^ "Washington state Sen. Kevin Ranker resigns amid misconduct accusations". Seattle Times. January 12, 2019. Retrieved January 14, 2019. ^ "Anacortes City Council member chosen to replace senator who stepped down amid harassment investigation". Seattle Times. February 5, 2019. Retrieved February 6, 2019. ^ "County councils select city council member to be 40th District state senator". Bellingham Herald. February 5, 2019. Retrieved February 6, 2019. This page was last edited on 30 March 2019, at 01:03 (UTC).